Check out BPI Credit Card and Shakey's Pizza Promo. 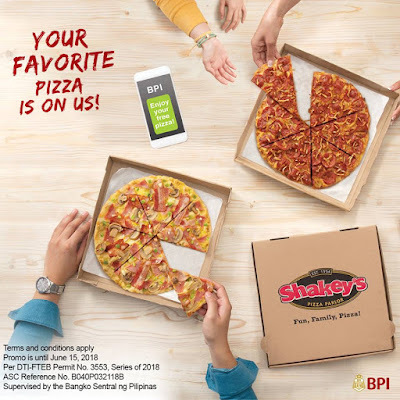 Shop Anywhere using your BPI Credit Card and with a minimum straight purchase of P3,000, you get a FREE All-Time Favorite 8-inch Regular Thin Crust Shakey's Pizza! Promo runs from March 15, 2018 to June 15, 2018. Redemption is until August 16, 2018. Check complete promo mechanics HERE!